Sleep-related infant death is the leading cause of infant mortality from one month to one year of age. Sleep-related infant death can result from unintentional suffocation/strangulation, or from Sudden Infant Death Syndrome (SIDS). SIDS is the sudden and unexpected death of an infant under one year of age which remains unexplained after a complete investigation. The best way to prevent sleep-related deaths is for all parents and caregivers to provide a safe sleeping environment for infants. The American Academy of Pediatrics (AAP) published its most recent recommendations for a safe infant sleeping environment. For the complete AAP guidelines on safe sleep click here. While babies should always be placed on their back to sleep, they need to be put on their stomach to play in the presence of an adult. Tummy time strengthens muscles important to baby’s development. Parents and caregivers can reduce the risk of Sudden Infant Death Syndrome (SIDS) & other sleep-related causes of infant death, such as accidental suffocation by creating a safe infant sleep environment. Babies will not choke when on their backs; this is an old myth. Babies should sleep on their backs for night time AND nap time. Bumper pads and similar products that attach to crib slats or sides are often used with the intent of protecting infants from injury. However, evidence does not support using crib bumpers to prevent injury. 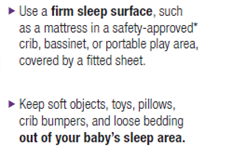 In fact, crib bumpers can cause serious injuries or death. Keeping them out of your baby's sleep area is the best way to avoid these dangers. Missouri Department of Health and Senior Services Safe Sleep message card (item #674 English, item #680 Spanish) is available here.